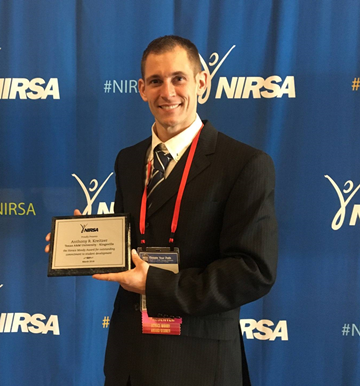 Anthony Kreitzer, director of campus recreation and fitness at Texas A&M University-Kingsville, recently received the Horace Moody Award at the annual conference of the National Intramural and Recreational Sports Association (NIRSA). The Horace Moody Awards are given to one NIRSA professional member from each of the seven regions to recognize their contributions to student development. Individuals are nominated by students and peers and the award is given to individuals who have made a lasting difference in mentoring students and guiding students in their professional development. At the same conference, Kreitzer made a presentation entitled Developing the HERO in your Staff. HERO is an acronym for four psychology theories used in a leadership theory called Psychological Capital—Hope, Efficacy, Resiliency and Optimism. Anthony Kreitzer has been director of campus recreation and fitness since September 2016. He came to A&M-Kingsville in July 2013 as assistant director of operations and competitive sports. Prior to coming to Kingsville, he was an intramural sports graduate assistant at University of Central Florida and facility manager/member services/fitness supervisor at University of Nebraska-Lincoln. He earned his bachelor’s degree in business administration in management with minors in economics and psychology from University of Nebraska-Lincoln and his master’s degree in sports and exercise science from University of Central Florida.